J.F. 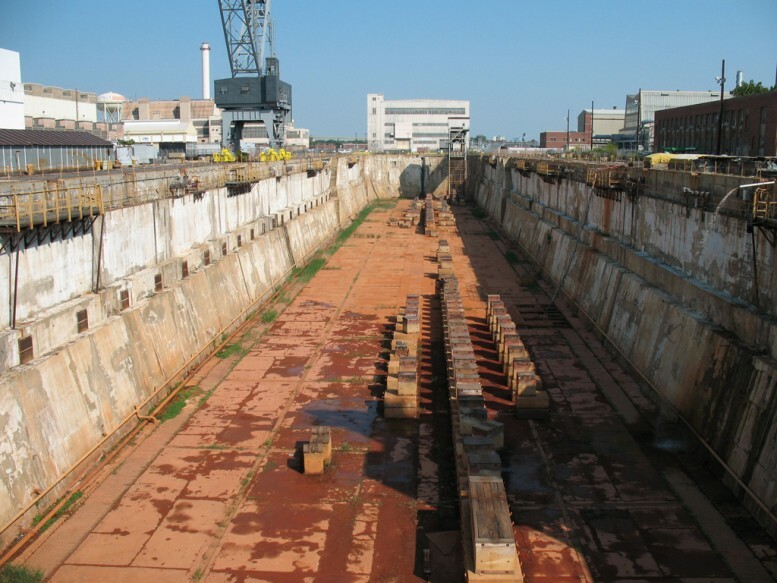 Lehman & Company retained Childs Engineering to inspect and assess the general condition of the waterfront facilities at two shipyards, Boston Ship Repair in Boston MA and Penn Ship Service in Philadelphia, PA. Both yards have significant waterfront facilities including graving docks, piers, and bulkheads. Engineers from Childs conducted both under water and topside inspections on these facilities and drafted a report summarizing the existing conditions and projecting the general condition of the facilities out 5 years and 10 years. The inspection included an 1146 foot long graving dock in Boston and a 1011 foot long graving dock in Philadelphia. At Penn Ship Service Pier 6 and Pier 6A also received underwater and topside inspections. These piers are old timber relieving platforms requiring special procedures for underwater inspection due to having to conduct penetration dives. Childs fielded dive crews consisting of engineer divers to inspect and assess the condition of the facilities underwater and topside. The same crews that inspected the facilities also drafted the report maintaining continuity throughout the inspection and reporting process. The inspection included the mechanical components of the dewatering systems such as valves, piping and pumps.